Action movie heroes are meant to be larger than life and cooler than cool, but sometimes the real story is just as insane as what we see in the movies. Here are ten action heroes based on real people. 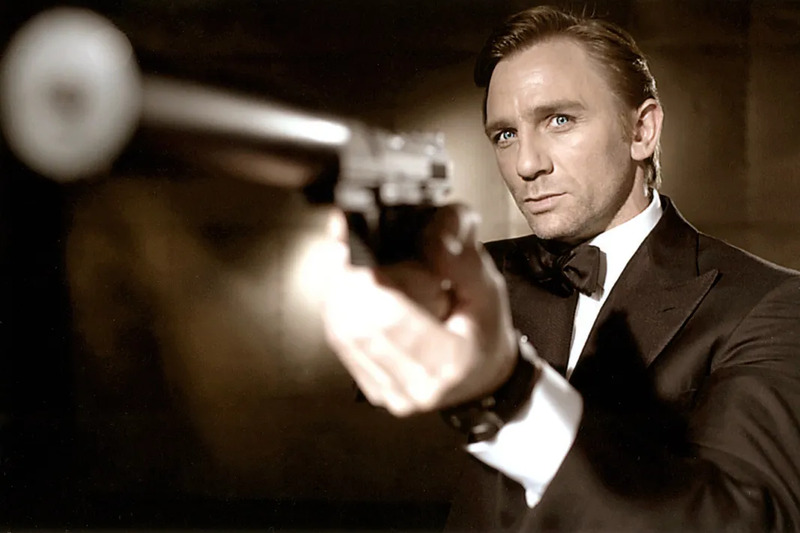 James Bond author Ian Fleming once admitted the character was an amalgamation of several people that he met while serving in the British Navy in World War II including Conrad O’Brien-ffrench, Patrick Dalzel-Job, Ian Fleming’s own brother, Peter (who served behind enemy lines) and Bill “Biffy” Dunderdale the station head of MI6 in Paris who wore Cartier cufflinks and handmade suits and was chauffeured around Paris in an armor plated Rolls-Royce. While Steven Spielberg and George Lucas have never confirmed any historical figure as the basis for Indiana Jones (Harrison Ford), Hiram Bingham III is a possible inspiration for the famous archaeologist. Bingham was a Yale professor, explorer, and United States Senator who lead the expedition to rediscover the lost Inca city of Machu Picchu in 1911. And what about fighting the Germans? Well Bingham’s son has got that covered. Hiram Bingham IV served as a Vice Consul in Paris during World War II and helped more that 2,500 Jews flee Nazi occupied France. After the war, Bingham IV traveled to Argentina where he helped track down Nazi war criminals in South America, which makes him a much cooler son than Shia LaBeouf. Depending on your point of view, Joaquin Murrieta was either an infamous bandit or a Mexican patriot. Called the “Robin Hood of El Dorado,” Murrieta was a famous figure in California during the 1850s Gold Rush and served as the inspiration for the pulp comic character Zorro. Former Top Gun instructor pilot and Congressman Randall “Duke” Cunningham claims to have been the inspiration for Top Gun’s Maverick (Tom Cruise), but the film’s producers have said that the character was based on the general stereotype of naval aviators, rather than a specific pilot. Duke was one of the most decorated pilots during the Vietnam War and was awarded the Navy Cross, the Silver Star (twice), the Air Medal (15 times), and the Purple Heart. After the war, Duke became an instructor at Top Gun where he developed a reputation for cockiness, entitlement, and self-promotion. From 1991 to 2005, Duke was a Republican member of the House of Representatives, but resigned his position after pleading guilty to accepting over $2.4 million in bribes, which would make a rather disappointing sequel. Like the character Nacho (Jack Black) from the movie Nacho Libre, Sergio Gutierrez Benitez was a Mexican priest who supported an orphanage for 23 years by performing as the lucha libre wrestler, Fray Tormenta (Friar Storm). Benitez retired from wrestling in 2011, but he still wears his red and yellow lucha mask while carrying out his day to day priest duties. Dirty Harry screenwriters Harry Julian Fink and Rita M. Fink admitted to modeling Harry Callahan (Clint Eastwood) after Dave Toschi, a former inspector in the San Francisco Police Department who was the chief investigator in the Zodiac Killer case. Even the film’s villain, “The Scorpio Killer,” was based on the Zodiac Killer. Dirty Harry wasn’t the only Hollywood film inspired by Toschi though. Mark Ruffalo played the detective in David Fincher‘s Zodiac and actor Steve McQueen copied Toschi’s distinctive quick-draw shoulder-holster by wearing his shoulder-holster upside down for the 1968 movie Bullitt. Tomb Raider‘s Lara Croft (Angelina Jolie) isn’t officially based on one person, but archaeologist and paleontologist Sue Hendrickson is basically the real deal. In 1963, Hendrickson took up a job salvaging materials from a sunken cargo freighter. After she got bored exploring sunken ships, Hendrickson worked in an amber mine in the Dominican Republic where she discovered three perfectly preserved 23-million-year-old butterflies (half of the world’s collection) and on August 12, 1990, while examining a cliff-side in South Dakota, Hendrickson discovered the largest, most complete, and best preserved Tyrannosaurus rex specimen ever found. Sylvester Stallone developed the idea for Rocky after watching a 1975 title fight between Muhammad Ali and Chucker Wepner. Even though Wepner lost the fight, “The Bayonne Bleeder” was able to go 15 rounds with the world heavyweight champ, earning him a reputation as a fighter. “I’ve been a survivor my whole life,” Wepner told a reporter, “If I survived the Marines, I can survive Ali.” Stallone later denied that Wepner provided any inspiration for the movie, but in 2003 Wepner filed a lawsuit and the parties settled out of court with for an undisclosed amount. In 2002, Wepner was arrested by the FBI for running a counterfeiting scheme where he and a partnered forged Ali’s autograph on a variety of merchandise. Frank Mundus was a shark hunter from Montauk, New York who reportedly served as the inspiration for Quint (Robert Shaw) in Jaws. Mundus earned criticism for his questionably ethical techniques, which included killing whales for chum and harpooning sharks (which sounds cool, but is super illegal today). In 1986, he set the world record for the largest fish ever caught when he snagged a 3,427 pound great white shark. He also unofficially harpooned a 4,500 pound white shark which is made more impressive by the fact Mundus didn’t believe in harpoon guns and preferred hand-held harpoons. That’s right, he preferred to fight sharks using hand-to-hand combat. Mundus was as well known for his catches as he was his eccentric personality and trademark look which included red and green painted big toenails, a hoop earring, an Australian slouch hat, and a shark tooth necklace. “He always said the charter business was 90 percent show and 10 percent go,” said Montauk resident Chris Miller. In his later years, Mundus became bored with shark fighting and turned his attention to conservationism where he campaigned for shark fishermen to catch and release their prey.